Designer Fashions at Great Prices. Condition: Well Used. Notes: Scuffs at bottom corners of bag. Slight discoloration and marks to exterior. Exterior: Leather. Interior: Canvas. Handle Drop: 8.5". Length: 6 ½". depth: 1 ½". Although there are signs of normal wear and tear, it is still in excellent condition. Also the corner of the front flap has a slight curl. The interior is immaculate and there’s no odor. I tried to capture all of the flaws in photos. Celine handbag. Condition is New with tags. Shipped with USPS Priority Mail. Vintage Celine Macadam Logo Clutch/Cosmetics Bag. Made in Italy. Zipper is brass and bag is in really good condition. No rips or tears. Leather is next to perfect. This is the perfect size bag for makeup and extras for travel or everyday. Condition is Pre-owned. Shipped with USPS Priority Mail. A very nice CELINE Embroidered brown leather tote handbag Handle is leather and round shape There is a logo zipper across top Very clean bag w 2 separate interior zippered pockets Logo on all zipper pulls plus leather Celine logo on front. Condition is Pre-owned. Please see pictures Shipped with USPS Priority Mail. Color : Browns. (Shoulder) Minor rubs on a part of shoulder strap. Minor spots on a part of shoulder strap. Shoulder (cm) : 79 cm. Material :Leather. Zipper works properly. (Bottom) Minor rubs partially. Celine Tote Bag. Condition is Pre-owned. Some minor wear and barely there stains. See photos. Shipped with USPS Priority Mail. OthersOutside: There are Losing Shapes and thin Wrinkles throughout. There is a partial wound. Inside: There is no noticeable Stain. Inside pocket: There is no noticeable Stain. Corner: There is rubbing, Stain. CELINE Boogie bag Handbag Leather[Used]. SpecStorage x 2,Zippered inner pocket x 1,Inside pocket x 2. OthersOutside: There are Losing Shape, Wrinkles, and thin Stain throughout. Inside: There is Stain. (Shoulder) Minor rubs on the edge of the shoulder strap. Color : Deep Brown. Shoulder (cm) : 46 cm. Material :Leather. Zipper works properly. (Bottom) Minor rubs partially. We apologize for inconvenience. Beautiful colorful Celine Trapeze bag! Shoulder strap has been replaced, not Celine. There are a few stray marks on this bag, primarily on the bottom and back, where they are not seen when carrying. Authentic Celine bag. Heavy wear outside, color fading and spots. Inside is nice and clean. Still wearable Low price according to condition Thank you for looking! New ListingCeline Cabas Animal Print tote shopper bag. 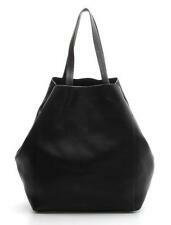 This tote has an interior lined in suede featuring a zip pocket and a tie closure at the top. 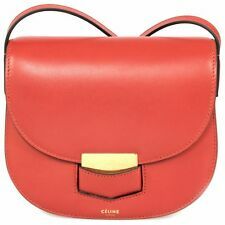 Celine Paris beautiful beige soft calf leather/ Orange trim accents. Stylish.. Condition is Pre-owned. Shipped with USPS Priority Mail. Color : Grays. Material :Canvas. Minor storage odor in the lining parts. Zipper works properly. We apologize for inconvenience. Country of Manufacture : Italy. or collected when you pick the item up. Bag is missing shoulder strap, but otherwise in pristine condition. Material :PVC. (Outside Flaws) Minor scratch on the leather parts. Color : Light Brown. Zipper works properly. or collected when you pick the item up. We apologize for inconvenience. Minor storage odor in the lining parts. Product rank will rank body, regarding supplies as long as this is not. OthersOutside: Dirt, rubbing, scratches, rubbing, wrinkles are very noticeable. Inside: dirt, scratches and rubbing are very noticeable. Material :PVC. (Shoulder) Minor rub on a part of shoulder strap. Minor twist on a part of shoulder strap. Shoulder (cm) : 117 cm - 120 cm. Color : Light Brown. (Bottom) Minor rub on the edge of the bottom. Authentic Celine. Made in Italy. Roomy enough to hold essentials. Shows signs of wear but overall in good condition. I’ve found the turn-lock for the strap would need tightening now and then. I see a flaw on hardware, refer to photo. Dust bag included. Shade of lilac purple, brown and green. Please do note one's viewing device may affect the color resolution. Please refer to photos for items' condition description. Details: Authentic. All items are from my personal closet. From a non-smoke but pet friendly household. Thank you for looking and have a fabulous day! Great price for this bag. Color : Browns. Material :PVC. (Shoulder) Minor rubs on a part of shoulder strap. Shoulder (cm) : 93 cm. Minor wrinkles on a part of shoulder strap. Minor spots on a part of shoulder strap. (Bottom) Minor rubs on the edge of the bottom. 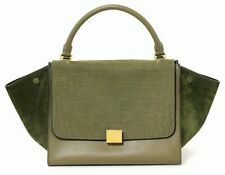 CELINE Macadam Shoulder Satchel Bag. Excellent condition. Perfect clean inside and outside canvas, have a minor defect outside leather. Material : Canvas Leather. Color : Pink White. strap drop 6 3/4" (7.2cm). INSIDE CELINE MONOGRAM LINING. BROWN SUEDE SMALL TOTE BAG. Shoulder Strap. Color BROWN. Each item is inspected for authenticity and approved by our authentication experts. Don’t wait any longer…. So there is no down side to consigning. Up for sale is pre owned Authentic Black Celine Handbag, in a good condition. We are willing to work out any problems or concerns you have. Tap here to see full item description. Black Nano Tote Bag. Condition is Pre-owned. Overall a beautiful and rare Celine bag. -- solid exterior body with minor dust marks and creasing on the nylon body. Made in Italy. New Celine box bag, made in Italy. Brand new and comes with all the things. Medium size 9"L x 7.5"H x 3"W Shoulder carry adjustable and aremovable leather strap with 18 in drop 100% authentic. AUTHENTIC Celine Pebbled Mini Luggage Tote Bag. Length (across bottom of bag): 12". No dust bag. Overall, it looks pretty good with light use. There is one small spot where the leather faded behind one of the handles. Impeccable used condition. Clean outside and inside. No flaws, no stains, looks new. Authentic Celine bag. Zippered Center pouch. Color : Beiges. Material :PVC. (Shoulder) Minor scratches on a part of shoulder strap. Minor spots on a part of shoulder strap. Shoulder (cm) : 90 cm - 110 cm. (Bottom) Minor rubs partially. We apologize for inconvenience. Signature required. See 3rd picture. This is a satchel tote bag by Celine. 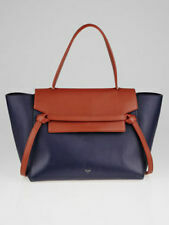 This bag has a zip top closure and has double, orange pebbled leather handles. This bag is composed of orange pebbled leather and is naturally lined in orange suede. Material :PVC. Color : Brown. We apologize for inconvenience. Code, Number etc. : M14. or collected when you pick the item up. The stitching is very tight and in good condition and the inside of the bag is in good condition as well. The leather handle of the purse appears to have never been used and is in like new condition, the golden chain is likewise in excellent condition. Celine offers women's handbags and purses in a variety of shapes, materials, handles, and decorative features to suit most preferences. You can find the right size, color, and type for your needs on eBay. What materials does Celine use? Calfskin leather: Many Celine styles are made of calfskin leather, which makes the bag feel smooth to the touch. Exotic leather: Celine handbags are also made in a variety of exotic leathers, such as snakeskin, alligator, crocodile, and python. Other leathers: Patent leather is used in some Celine styles to give the bag a shiny appearance. Pebbled leather is also sometimes used, such as with the Nano and Phantom luggage bags. Woven textile: Woven textiles are used for a multicolored, patterned effect. Cotton canvas: Celine sometimes uses cotton canvas for a more casual look. What handle options are available? Hand carry: Some Celine models offer a hand-carry option, including the clasp bag. Shoulder carry: Shoulder-carry options are also available, including for the flat tote. Cross-body carry: These styles give you the security of the bag's strap being carried across your body from one shoulder to the opposite hip. Combination: Many of the bags give you the option to carry them in several ways. For example, the frame bag, soft cube bag, trapeze bag, Nano luggage tote, and tri-fold bag all offer both hand and shoulder-carry options, and the swing bag allows the wearer to use both the shoulder and the cross-body alternatives. What shapes are used for Celine bags? Structured: Celine often uses structured shapes for its bags, such as the classic clasp bag. Unstructured: Unstructured shapes are also used in some Celine styles for a more casual look, including for the Swing bag and the Phantom luggage tote. Combination: Some Celine styles include both structured and unstructured shapes. This can be seen in bags such as the box-clasp style. What are some decorative features used in Celine handbags? Colors: Celine handbags are available in a variety of different colors, including ivory, soft pink, burgundy, soft green, tan, and navy. Styles such as the frame bag, micro luggage bag, and Cabas bag are available in two-toned options. There are even tri-colored options, such as with the Cabas bag. Some purses, like the soft cube bag, have contrasting trim for an added disparity of color. Organization: Outer zippered pockets provide additional storage on some of these bags, including the Phantom luggage tote. There are also inner zippered pockets and credit-card slots available with some styles. Hardware: Both gold-toned and silver-toned hardware are used on various Celine bags. Content provided for informational purposes only. eBay is not affiliated with or endorsed by Celine.